How Did A Confederate Flag Get Aboard the International Space Station? A seller on Ebay is currently offering confederate flags which have flown aboard the International Space Station. 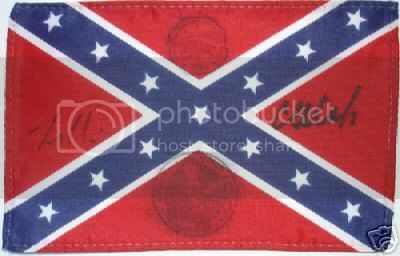 [ see this eBay link: Soyuz TMA-5/ISS-10 Flown American Confederate Flag ] The question many are asking is why NASA would allow the flying of a symbol many people find to be offensive. The item description is as follows: "4 x 6 inches American Confederate Flag flown on board Soyuz TMA-5 and International Space Station 192 days during Expedition-10. Cancelled on orbit with three handstamps (main handstamp BOARD OF ISS and two round onboard handstamps Soyuz TMA-5 and ISS-10). Signed by ISS-10 crew Leroy Chiao (ISS-10 commander) and Salizhan Sharipov (Soyuz TMA-5 commander, ISS-10 engineer)." When I asked Leroy Chiao about this matter today he replied "The Confederate flag story is a mystery to me. I don't remember seeing any aboard the ISS and I certainly don't remember signing one. I am baffled by the whole thing and can't even speculate on it." NASA PAO checked the manifest for that mission - and all that is listed is "flags". No mention is made of what the flags were. According to PAO, NASA JSC personnel do not recall seeing any confederate flags on any space shuttle manifest - so if they were launched, it would have had to have been aboard a Soyuz spacecraft. As such, neither Leroy Chiao or NASA had anything to do with the flying of this stack of confederate flags. Yet this eBay posting claims that Chiao signed these items. An image on this posting seems to have two stamps and two signatures on it - but none of these marks seem to be legible. However, since the Confederate flag does not represent any existing nation, and the stack of flags was flown into space for the purpose of being signed and stamped, it would certainly seem that Salizhan Sharipov had to have been aware that there was a commercial aspect to this. Of course, these flags are now for sale by a vendor (Alex Panchenko, USSR-AirSpace.com) who has a business that sells things that have been in space. Indeed, Salizhan Sharipov signed certificates authenticating this item. An image of this certificate was originally part of this eBay listing but has since been removed. I wonder who's nutty idea this was, and what the cut is on the sales to those who endorsed it. To make money, you do not have to actually own the object. Just say that you do.